You know how I keep yammering on about saving all the unused bits and pieces of your farm share veggies in a Soup Pack? Today I'm going to show you how I use a soup pack to make a brown (beef) stock, then use some of that stock to make soup. This soup got started with the cow taking up residence in my freezer. I asked for all the odds and ends of the beast, from tongue to tail and odd bits in between. We got several packages of "soup bones" and today I got one out, along with a soup pack. Instead of randomly throwing ingredients and insufficient salt into the pot, like I usually do, I decided to <gasp!> follow a recipe. Well, loosely. I consulted my handy 1950 Betty Crocker's New Picture Cookbook. I was interested to read "Store covered in jars in the refrigerator. The layer of fat on top will help preserve the stock." I usually freeze soup stock, and at this time of year freezer space is at a premium, so I gave it a go. I heated the jars as if I was going to can the stock, then poured the strained (ooh! used my cheesecloth! bonus!) stock into the hot jars. I used my plastic screw top lids since they work in the fridge or freezer. When I was ready to make soup I scooped off the fat layer (reminded me of my mom's wax on top of jam) and poured out the stock. Heat oil in a large heavy pot over medium heat. Brown meat on all sides. Add water. Bring slowly to a boil. Skim the scum. Say that 3 times fast. Skimthescum.Skimthescum.Skimthescum. Add the rest of the ingredients. Cover, and simmer for 4 hours, stirring occasionally. Strain through cheesecloth. You know how you read a bunch of recipes calling for an ingredient you've never seen, then, some time later, you stumble over that ingredient--so of course you buy it? Then you have to re-find those recipes and figure out what to do with that rare-to-you ingredient? You're reading a food blog. I suspect this has happened to you. I'm going to call it the French Green Lentil Effect. This time (ok, it happens to me often) I was at the farmer's market picking up dill seed for my pickling adventures when I saw a bag of French green lentils in the same stall. I'd read a bunch of recipes calling for them, so why not? I promptly put them into the pantry and forgot about them. Until today--when I wanted to make beef and barley soup and stumbled over the French green lentils while searching for a non-existent bag of barley. Semper Gumby. I'm making French green lentil soup instead! Heat oil in a large heavy pot over medium heat. Add onions, celery, and carrots. Sauté 10-15 minutes until beginning to soften. Add garlic, tomatoes and paste, spices, and cheese rind. Stir. Pour in beef stock, bring to a gentle boil. Add lentils. 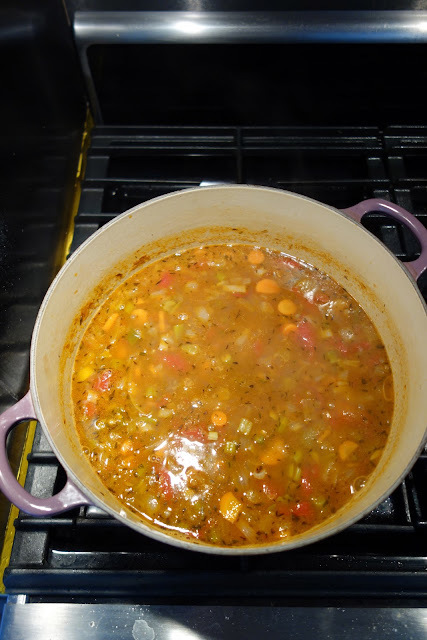 Cover and reduce heat to keep the soup at a slow simmer for 1 to 1 1/2 hours. If desired (by children who like smoother soups), blend with an immersion blender. Add in optional meat after blending. Delicious on a cold rainy day, with a loaf of Artisan Bread in 5 Minutes on the side. This post is linked up with What's In The Box at In Her Chucks and Food On Friday (twice). This totally reminds me of Stitch from that Disney movie Lilo and Stitch. Love me some lentil soup! I just got a new bag of lentils (not French green, just brown I guess) in the marked down section of the store. Time for a new batch. Thanks for stopping by! I think lentils are completely underrated, and it's amazing how you make your own stock. I've been tossing my unused bits and snippets down the disposal (it breaks my heart; I'm working on composting soon), but this is a much better idea. Thanks so much! Meghan, I would like to say it's a difficult and painstaking process but in reality it's too damn easy not to, you know? 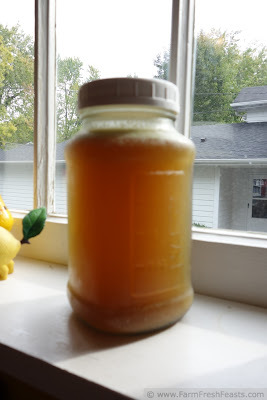 I just typed up a chicken stock post where I literally throw the carcass from a rotisserie chicken into my crock pot, add a soup pack and water, and walk away. Then I come back, turn on the crock pot to low (key!) and walk away again. Lydia at the SoupChick blog (or A Perfect Pantry?) has some great stock tutorials too. Thanks for stopping by! Heather, thanks for hosting! I get such inspiration from your links (as well as your site). The other day I ate an Indian lentil soup as a starter and now I'm obsessed with recreating that. I have brown lentils, not yellow, but I have plenty of turmeric. Stay tuned. Thanks for stopping by! Thanks for hosting Food on Friday!